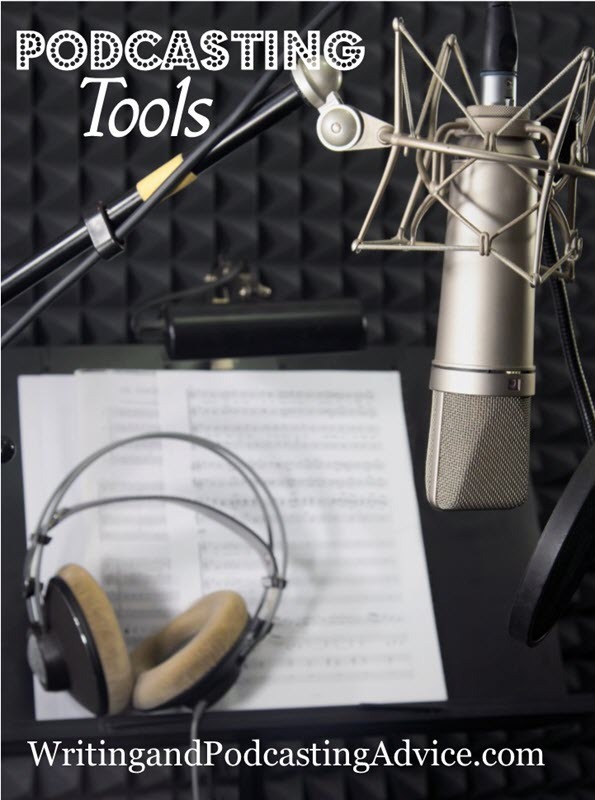 You may think that podcasting tools only means the microphones, the soundboards or what is the best computer program to use in creating a quality product. Well, while those things are important it is the “tools” you use beforehand that makes a significant difference. In this episode of Writing and Podcasting Advice, Felice tackles the tools of the trade and what she uses almost every time she prepares to create a new podcast. Ideas notebook – use technology – such as a smart phone – I also use a calendar and create ideas for upcoming podcasts in groups of 4 or more per month. You can use a word processing software or some people like Evernote. Script: I outline each show – making sure to add information such as where to find the show notes, o to how get the pdf I might create for the show or even where to get more information, perhaps an extra audio or opt-in for a sample product. This is typically written in a word processing software. If you want to collaborate with someone you can use the Google Docs free software with a Gmail account. Recording room. A friend used to record her songs in the bathroom because of the amazing acoustics in that small space. I use a room with carpeting and wall hangings that absorb the sound … you don’t want anything that causes reverberation or echoing that can cause a horrible sounding audio. Interviewing: I use paid software like InstantTeleseminar (affiliate link here). What I like – you can use your cell phone to call in, interview one or multiple people at a time, and add an intro, and outro music or commercials – and download the finished product to your own computer! It is awesome. The downside, the audio sounds like a phone call. Another alternative is to use Skype – some people prefer this. I don’t personally use Skype but I’ve been interviewed by people who do – You can look at your windows or mac computer for apps to record the conversation on your computer. You may need to combine tracks with your own audio editor. You can record on your iPhone or Android phone. Recently one of my podcasters sent me an audio recorded on her iPhone and I was shocked at the great quality of the audio. She doesn’t have the most recent phone, either. It worked great. Look for recording apps in your app store. You may be surprised at the quality results. We’ve come a long way in the improvement of software. Recording microphones. My two personal favorites are simple USB plug in microphones. The first is a Samson CO1U Studio condenser mic. I use this with a cover (to prevent the “popping” typical of saying an “p” word. This mic is awesome for interviews or presentations. It will pick up sounds across the room, so you will get audience background noise – laughter, clapping, etc. The second is the audio-Technica ATR2100-USB. You have to hold this microphone close to your mouth for good quality audios but the plus side, you can’t hear background noise. It is a very good quality. Recording software. There are so many options I’m not sure where to start. You can use an online option like InstantTeleseminar however if you want to record on your computer two free software can not be beat! The first is audacity, the second is GarageBand standard on a Mac. I use both a PC and a Mac. The Mac quality for recording is wonderfully rich. I tend to use the Mac and save it to a mp3. You plug in your microphone and go! This software also allows you to edit. Visit youtube for videos on step-by-step solutions. Album Cover Art. Here you need a graphic artist or someone that understands good quality cover art. iTunes standard at this time is 1600x 1600 dpi or 2400×2400 dpi. This has changed recently, in the not so distant past the dimensions were 1400×1400 – this is something we keep track of with all of our podcasters on this network and others I run. ID3 Tagging. Each audio must be tagged. It is similar to adding a byline to a document so that you add your copyright information. I use ID3Tagger software but there are many out there. Image editing online – Canva, PicMonkey, or install GIMP (which is like Photoshop). You can subscribe to Adobe online tools or Microsoft products. I have moved to a yearly subscription over purchasing the software since it is less expensive and keeps me up to date with the latest improvements. I use Microsoft publisher but there are a few steps I go through to get the finished product. It is a software I’m comfortable with having used it since 1992 – yes, that long, so it is second nature to me. Email – many use MailChimp because it is easily integrated into WordPress websites, I use ActiveCampign. This post may include affiliate links where I may receive compensation via click-throughs, however I use other things that are often not affiliates as well.